One thing I could not see in your block. Is the brass baffle still under the thermostat? You need that in there and the correct Cleveland thermostat to keep temp correct. Headers fit just fine with an AOD. (02-12-2019, 04:48 PM)Carolina_Mountain_Mustangs Wrote: One thing I could not see in your block. Is the brass baffle still under the thermostat? You need that in there and the correct Cleveland thermostat to keep temp correct. Yep, its there but thanks for the reminder. 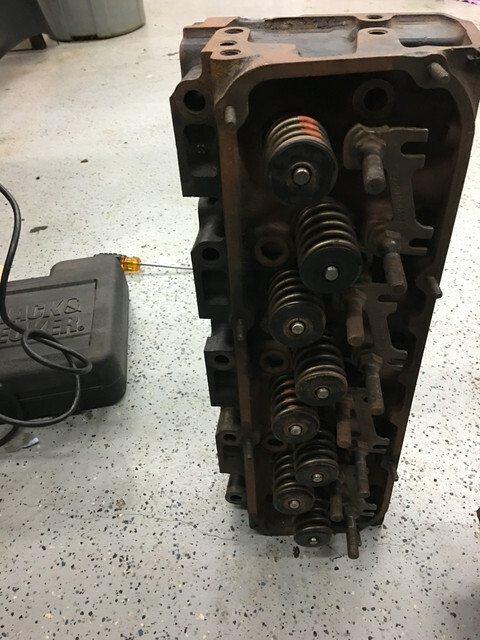 Here are the D0AE-N quench heads we will install on the 357CI 4V Cleveland. Heads were originally set up for the Comp Cams hydraulic roller. All new springs, locks, and retainers. Dropping them off to be taken apart, check clearances, spring height unshroud the valves, valve job and reassemble. Hoping the unshrouding process will grow the combustion chamber by 5-7CC's. I figure the little Cleveland should achieve the 400-425hp goal fairly easy. My 15 year old is going to enjoy the streetable manners of the EFI and AOD. If those are factory style 4 groove welded valve, throw them in the nearest dumpster and get a set of single piece valves. They have a tendency to snap the head off and the results are not pretty. The answer to factory valves is "NO". Nah, the installed valves in D0AE-N heads are stainless but I do not know what brand. If they need to be replaced I will use Ferrera 5000 series since it a true street driven vehicle. If I were building to race we would probably do something more exotic along with titanium retainers and bee hive springs. Thanks for your input. I always welcome reminders on a build.